Co-parenting is fraught with problems. After divorce or separation, emotions can run high which can make it hard for parents to cooperate with each other and focus on what is best for their children. You will make mistakes. We all do. What's really important is having the ability to recognize when you've made a mistake and take the necessary steps to make amends. Not only does this give your kids a positive role model to follow when they face difficult situations in life, but it shows them that you will do everything possible to be the best parent you can. One of the hardest parts of co-parenting after divorce is learning how to put aside your own emotions and focus solely on your children, their needs and what's best for them. As a co-parent there will be times when you lose your temper. Aside from your children, your co-parent knows how to push your buttons like no other person. There will be times when they say and do things that set off your triggers, cloud your judgement and your ability to be mindful of your behavior and emotions. Sometimes this will be your fault, sometimes theirs. What can you do? When you're the one in the wrong, say so. Always apologize, even if the other parent doesn't reciprocate when they are in the wrong. Not only will this take the fuel out of the fire, you will be showing your children how to deal with conflict and the importance of being able to admit when you are in the wrong. An added bonus is that you might start building some bridges and your co-parent might model similar behavior. Try to avoid conflict by keeping conversations limited to parenting and try to avoid being pulled into an emotionally charged conversation about past wrongs. Try to really listen to the other parent's point of view and if you still disagree, then work to find a compromise that works for both of you. After divorce or separation, emotions are charged. There are times when even the most well-intentioned parent will inadvertently use their child as a way of getting back at their ex. Often parents compete to be the "fun" parent by breaking rules or buying gifts. We all want to make our children happy and staying up late to eat ice cream or a taking trip to the toy store are both quick and easy ways to achieve this. Another common mistake is refusing to compromise when it comes to requested changes to the parenting schedule. Parents often justify these special requests as "unreasonable" or complain that they weren't given enough notice. Point scoring between parents is an easy trap to fall into and sometimes it can be hard to recognize this behavior in yourself. A common mistake by divorced parents is to communicate through your children. After your divorce or separation is finalized, you might want to have as little contact with your ex as possible. But your parenting relationship will continue for some time and there are still things you need to communicate about. It's easy to see your child as a way to pass messages between you and the other parent and it can seem harmless enough to ask them to pass a note or tell them you are going to be late for pick up today. But you are literally putting your child in the middle and asking them to be mature enough to deal with the emotional response from the other parent. It's also showing them that there is still conflict between the two of you and your child will inevitably feel torn. Another trap parents fall into is asking your child to choose a side when there is a scheduling conflict or who to spend Christmas with this year. You may think you are being fair by giving them the choice but you are putting the responsibility on your children to make your grown up decisions. What can you do? This is a simple rule to follow: never ask your children to convey a message to the other parent or to communicate on your behalf. Find a way to communicate that works for you: if you can't face speaking to your ex face-to-face or over the phone, then use a co-parenting tool such as coparently so that you can communicate effectively and in a child-centered way. And don't put your kids in a position where you are asking them to pick a side. It is inappropriate and simply not fair. Bad habits are hard to break. 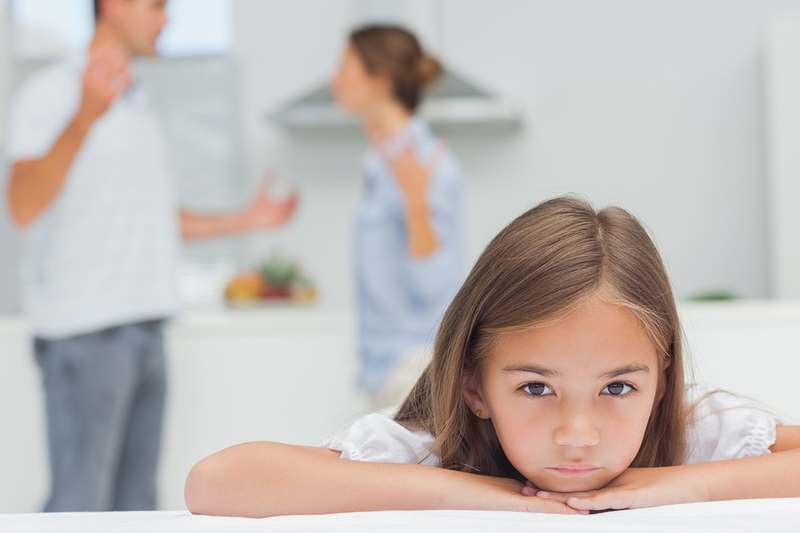 Before your divorce or separation, it's likely that you argued in front of your kids. This can be a hard pattern to get out of and it's all too easy to fall straight back into the trap of blame and anger if the other parent consistently picks up late or forgets to bring your child's backpack on a Sunday evening. You may also find yourself making comments like "that's just like your father" or "That's typical! Your mom's late again! Now I'm going to be late". However it's important to know that these bad habits are amongst the most damaging for kids of divorce so it's important to minimize this behavior as much as you possibly can. And ideally, stop it completely. What can you do? Find an outlet where you can process your feelings and express yourself freely – your friends, a therapist, a divorce coach or support group. Develop some coping mechanisms so that when you interact with the other parent, you are able to do so in a calm and rational way without letting your emotions get the better of you. Also keep in mind that your kids identify character traits in themselves from both parents so when you are leveling criticisms at your co-parent, you are leveling at your children too. What can you do? Children do best when parents are able to establish a respectful and co-operative relationship. To achieve this, you will need to find a way to transition from your spousal relationship to a more business-like relationship, focused solely on your children and their needs. Be respectful and communicate in the same way as you would with a colleague. If you feel that you are unable to communicate effectively with your co-parent face-to-face, then using a tool such as coparently can really help to facilitate a business-like relationship and help to keep things child-focused and on topic. Spend some time understanding your triggers. Are you annoyed by late pick-ups? Do you get angry about a lack of discipline in the other parent's house? Fed up with clothes and belongings being lost or frustrated by the eye roll? Once you have worked out what sets you off, you can be mindful of your response when faced with these triggers and make a conscious and positive choice to respond in a calm and measured way. Work together to create a set of ground rules that cannot be broken, like a business contract between the two of you. Be sure to do this at a time when neither parent is upset or angry. These ground rules may include things like, don't use the children as messengers, don't argue in front of the kids and don't bad mouth the other parent in front of the children. Once you have agreed on the ground rules, work out a plan of action for when one parent breaks the rules. Basically you need to give each other permission to hold the other parent accountable and to state when a parent breeches your agreement. You might agree to say something like "let's try to keep within our ground rules." It's helpful if you have a contingency plan if one parent is too upset. Perhaps you can agree that the best course of action in this circumstance is to stop the discussion and pick it up again when both parents are feeling calm. We all have bad days – make sure you have a plan in place to deal with them when they happen. When you're in the wrong and you feel sorry about something, make sure you apologize sincerely. Apologizing can really turn your co-parenting relationship around and help to move you to a more business-like and civil relationship, rather than an adversarial one.